“OK,” I say, “Do it your way.” And you know what? She was great at it – making compromises from a position of strength. After building seniority and gaining respect for her ideas, she chaired the Senate Energy Committee passing the most significant environmental protection legislation in decades. But it wasn’t always easy. Talk about balls! So there’s this terrible bill that will say burning-up used tires counts towards meeting renewable energy mandates despite the polluting nature. It has passed the House and come over to the Senate as a “message from the house,” meaning even though there is no Senate version of the bill (because Ellen fought it back in the committee process), it is before the Senate for a straight up or down vote with no amendments possible. It’s supported by Governor Pawlenty. It’s on the Senate Floor on the very last night of the legislative session. The hour is late. Ace ran the clock out, albeit amidst chaos, all the way to the stroke of midnight – the point at which no more bills could be passed – as dictated by the Minnesota Constitution. And I think she even had the support of a majority of her colleagues. The next day the Governor called a Special Session to deal with the budget impasse that had deadlocked the Republican House and the Democratic Senate. So the tire-burning bill wasn’t dead beyond resuscitation. 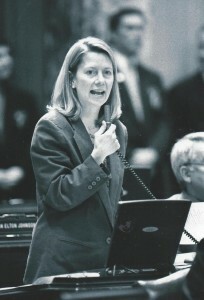 When the lobbyists asked the Governor to include it in the budget solution bill, Ellen asked to meet with the Governor. At that meeting one of the Governor’s cabinet members starts out with, “You know Governor, she’s right. The way the bill is written is not good for the environment.” And on the spot, Ellen, the Governor, the Governor’s staff, and the author of the bill worked out a compromise that everybody could breathe with.